Working on an upside down hull is oddly anonymous, there is little feel of the boat's final shape and character and to an uneducated eye no real idea of how the water will flow past the hull. Proportions are distorted and its not really a “boat” to the eye until the magic day comes when she is upright. We’ve just hit that day with Resolution. After another trip to Bart's Laminated Timbers to raid the reject rack I drew a sketch plan of a rollover cradle that would use the material we had. The intention was to support the boat and isolate it from the strain of sitting on its gunwale as she came over, and to support the keel if we dropped her on the way over. A good shot of the cradle and the block and tackle set used to heave the boat over. A similar block and tackle set was used on the other side to take control as the hull came past the balance point. I'd eyeballed the ceiling height as being just adequate, and with her part way up it was time to check. We were ok, just! We lost one light bulb when the cradle contacted it, but otherwise we had about a handspan width to spare. We also drilled and fitted three big lengths of threaded rod to put that big300 kg stack of kwila deadwood (keel) under compression so it would be better able to cope with the shocks and strain of being on its side, as mentioned in the last diary this was a potentially scary job but with some preparation and care it went well. The day arrived when the workshop had been cleared out to make space. The cradle was all built, and we had run out of things to do. It was time to give it a go. Friend Andrew turned up to have a look at the project, just perfectly on time. He had a couple of hours to spare so was roped in, and we got on with it. We had a big block and tackle each side, one pulling to bring the boat over and one as a brake to prevent a runaway. Andrew took the brake, and we two pulled her up on one corner of the jig, tied her off and checked carefully that all was well. No problems, as the steel portal frames that my workshop is built around are at wide spacings so we were not able to pull perfectly square. So there was just a slight skid of the jig that had her slightly off line. We pushed her back straight and put a rope on one end to prevent more movement. Halfway - the building frame is about to come off, and the hull can then be moved across on the pipe rollers to position her for the next stage of the rollover. This workshop is only just big enough to flip the boat without having to drag her outside, but with some care it worked out fine. Up the right way! Yeehah! No accidents, not even any "oops's". Once on her side the building frame/jig had to come off, this is a pretty big construction, 180mm x 75mm laminated beams almost 6m long with legs, cross pieces and lots of uprights and braces. Heavy! The hull is not easy to handle and jacking it up in the air to get it off the jig was not an option so we had chosen to put the boat on her side and then unbolt it, take it away and then continue the roll. That all went well, I can see where the big pile of bolts went, lots of them. We pulled all but one middle bolt out, got one of us on each end and pulled the middle one out, and walked the jig outside though the big double doors. All of a sudden there was a lot more space in there! After some checking we pushed her across the workshop on her pipe rollers so there would be room for the second part of the rollover, tied her off again and pulled. Over she came, Andrew on the brakes taking control of the movement as she went past the balance point, and putting her gently down right way up and stable. Whew! Another one of the big scary jobs all done. No problems, and with careful preparation plus some welcome help from Andrew not that hard to do. 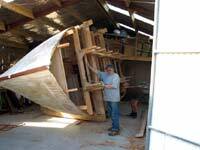 After Charlie had sat in the saloon, a big grin all over his face, he pitched in to pull the no longer needed cross pieces and braces out, making the space much more easily seen and giving the boat a feeling of what she may feel like when finished. Done, the happy builder sitting at what will become the galley. How’s that for a big grin! Ready for the next few months intensive activities, there's lots to be done but its mostly a lot of small jobs rather than huge pieces of lumber and heavy work. Comfortable is a word that comes to mind! Lots of room, nice long bunks, plenty of legspace, lots of storage and lots of elbow room. Drawing a boat on paper is a matter of theory moderated by experience, but its really nice to be inside and see that she is as intended. 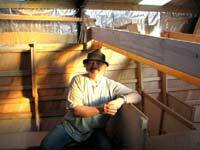 We brought the stripped building frame inside, set it up alongside the boat with some old scaffold planks (thanks again Bart's Laminated timbers) as a decking, and built a ladder to ease the task of climbing in and out. That’s all done but its still 2 metres up to the gunwale and a long climb if done too often. So, a small GMC 150mm ( 6inch) bandsaw ( Ryobi make a similar one) was purchased, mounted on the galley bench flat this, together with a vice and a few other bits and pieces transfers the workbench function inside to save that climb. 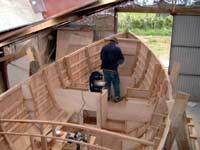 While the little bandsaw is small and lightly built, if used carefully it can cope with up to 50mm cut and will be able to cut almost all the materials used for building the boats interior. With that done, the first job is to begin the task of scraping and sanding the inside of the planking where epoxy has been forced through the gaps and screw holes when the second layer of planking was being fitted, a choice of what to finish the interior with has yet to be made, varnish or paint? There are advantages each way, and I suspect that paint will be the choice, but it still needs good preparation. Use your imagination here. Right up in the bow is the forward crash bulkhead, Charlie beginning the process of bonding it to the skin with wooden fillets and glass tapes. Forward of that will be an anchor well up at deck level, and an awning locker behind a watertight hatch under that. Just in front of the builders knees is a half crash bulkhead ahead of which is to be a chain locker, with sail storage each side of that. The chain will live in a canvas bag slung from supports low down in the boat, and it will run in through a deck fitting and chain pipe. Where Charlie stands there will be a portapotty, and an area set up as a washroom and ablutions area, each side of that there will be big bins with smaller lockers up under the decks for Bosuns stores. Plenty of room up here. To port with the little bandsaw on it is the galley, not large, just a single burner stove and a bucket for a sink. The KISS ( keep it simple, stupid) principle applies here while to starboard you can see the framing for the chart table and the storage drawer underneath it. Scraping and sanding a surface as big as Resolutions interior is a monotonous job, and to make it easier to tolerate there are several other jobs going on at the same time. 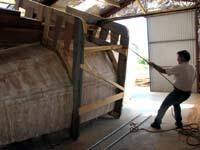 One being the preparation of the watertight bulkheads for sealing off with fibreglass tapes. This entails filling any gaps between the frame edge and the planking with glued in wooden wedges then putting 100mm wide glass tapes in so the frame is very strongly bonded to the skin and can contain water on one side even when the skin is damaged. This also has the effect of somewhat containing damage as smashed stringers and planking tend to stop at the strong point that the watertight bulkhead provides. There are Watertight bulkheads at frame one right up in the bow, another half height one at frame two, a low one at frame four which will contain any free water in the area. There is another full bulkhead at the after end of the engine bay and the engine sits in a watertight compartment some 250mm deep so the likes of a leaky shaft log, or a weep from the engine water cooling skin fitting or hose will be contained. 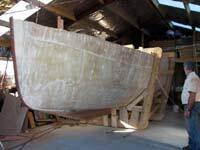 With the boat up the right way, the project takes on new life, there is a sense of excitement, and visitors are universally blown away by the feeling of strength and space that this little boat has about her. 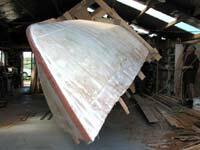 Lots to do, I’ll be in there carving that propellor aperture this week, Charlie's inside the boat cutting wood on his new little bandsaw as I write. 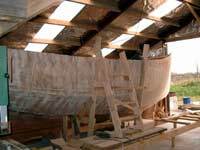 The sheerline needs to be trimmed and the boat levelled so her shape will be more easily seen. She’s a bit bow down as you see her in these pics, by next weeks Diary I hope to have some better pics of the interior. My little camera has no wide angle lens and Navigator owner John Leathwick is coming over to take some for you.